The software giant has just released a new report locally, entitled Embracing digital transformation: Experiences from Australian organisations. The report was based on in-depth interviews with 30 organisations to gauge perceptions and experiences across their own digital transformation projects, including KPMG, Cricket Australia, Macquarie Group and Webjet. According to the report, most organisations are undertaking digital transformation in a series of strategic shifts, viewing it more as a journey than one overarching change program. Those surveyed were split into two camps: Proactive and Embracing organisations, who are making transformation a top priority and empowering their people to pursue it; and Motivated but Constrained organisations, who often find digital efforts hampered by internal obstacles. Those leading the pack shared several common elements, but it was the role of people, in terms of leadership, culture and ambition, that proved most powerful. Successful transformation programs had buy-in from across the business and leadership, an entrepreneurial mindset and culture and access to talent, and were building systems to capture data and convert it into insights at scale, the report stated. Proactive organisations also recognised the importance of questioning existing business models and experimenting with new ones. But what was also clear from the report was that many were only in the early stages of acting out a digital transformation process, with many programs of work started in the last two years. In contrast, constrained organisations were more likely to deploy point solutions, lack leadership buy-in or a clear vision for digital, and be risk averse. And while there is no right or wrong way to tackle digital transformation, the report did find most organisations opting for a test-and-learn approach involving discrete projects and experiments, rather than business-wide structured programs. These allow for fast iteration, encourage buy-in from the rest of the business and more adequately address the rapid pace of change. From there, organisations harnessing digital successfully move on to other areas including empowering employees, optimising operations and transforming products. Technology still plays a role of course, and the report found cloud-based solutions, the Internet of Things, robots, artificial intelligence and virtual reality were all expected to have a significant impact on digital transformation and capabilities in the next five years. Microsoft CMO and COO, Rachel Bondi, said the report findings show transformation is about mindset, leadership and culture. “As leaders, it’s really about empowering our employees to have that conversation around digital transformation,” she told CMO. “It’s not just IT anymore, it’s about all business leaders having that conversation. 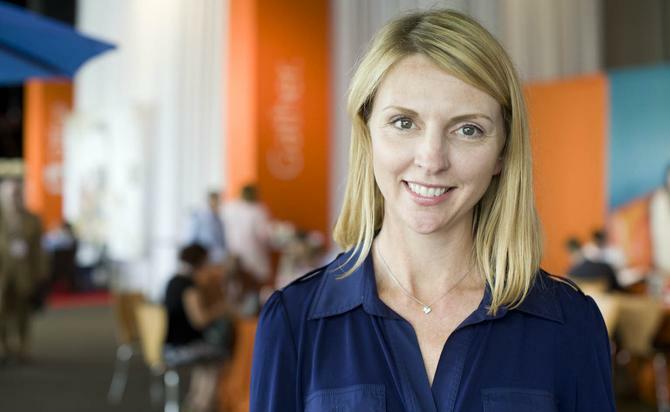 Bondi has spent the last year as joint CMO and COO of the Australian subsidiary of Microsoft, and has been with the software giant for 16 years, mostly in its US corporate office and covering a range of marketing roles. She argued marketing plays an increasingly important role in digital strategy and innovation, and pointed to the example of digital change for the Royal Easter Show (run by the Royal Agricultural Society of NSW), led by the marketing organisation. The institution has more than of 20 years of data on consumers and recently introduced geo-targeting capabilities to provide consumers with personalised itineraries onsite depending on where they’re located and time of day. What is often stopping or hindering marketers from taking the reins is data, Bondi claimed. The report stated leading organisations typically transform the customer experience first, using data to win, grow and retain their customer base or better serve citizens. “Every conversation I have with our field team starts with the data we’re delivering to the business – new customer insights they may not know about. When you’re working with sales or product teams, they want to know more what’s driving customers,” Bondi said. As a case in point, Bondi said Microsoft is working to innovate through regular marketing hackathons, where cross-functional groups get together with customers to look at the data and come up with new business models. To do that, marketing must be highly collaborative, Bondi said. “I try to spend as much as I can with our sellers as much as our marketers, because it provides really good insights into what’s happening in market. We also use our tools a lot – whether it’s Yammer for ideas sourcing… or Microsoft Teams. There’s a lot of collaboration across different areas. And I know when I’m working with the extended team, communication is really important. As another way of showing how marketing is tuning in to the end-to-end customer experience, Bondi pointed to its social media command centre investment. “Having that pulse as to what people are saying, the good and the bad, then working with the marketing and sales teams about how to enable deeper conversations with customers, is great,” she added. Bondi said her big priority now is people and investing in existing talent. “How you evolve all the marketing functions to be the modern market is a major focus,” she said.